The other day Stéphane brought a trailer load of sand up and parked in our backyard. He spent the morning making concrete. At lunchtime he found he had some concrete left over, so he decided to use it up by filling in some potholes in our driveway. 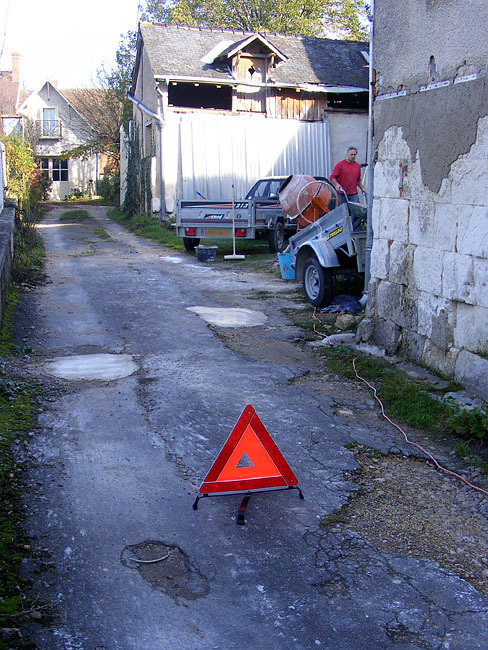 Fortunately, his lunch was within walking distance, and I set up a red triangle to warn our neighbours when they came home for lunch. attachiant(e) – someone you cannot live with but cannot live without. A combination of attachant (captivating, endearing) and the slang word chiant (bloody nuisance). 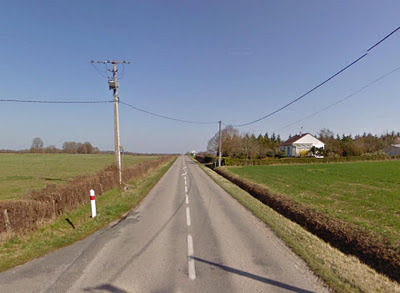 Second was aigriculteur - a farmer unhappy with his lot in life. A combination of agriculteur (farmer) with aigri (embittered) and with just a hint of aïe! 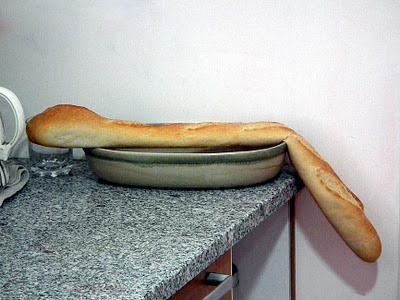 (French for ouch!). Other words the festival has thrown up are bête seller, describing a particularly awful literary work that becomes an instant hit, the timely eurogner – euro plus rogner (to cut down) – to suggest making savings in the euro zone, and a verb, textoter (to write SMS messages on a mobile telephone), to compliment last year's winner, a phonard – a pejorative term for someone who is glued to their mobile phone. Even though I have read a number of bête seller in the past, the only one of these words I can imagine I will use with any frequency is phonard, but it's good to know the other words are available, just in case. 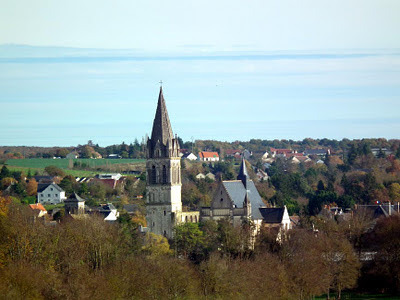 We were surprised and delighted; we had not suspected that Loches was so good. I hardly know what is best there: the strange and impressive little collegial church, with its romanesque atrium or narthex, its doorways covered with primitive sculpture of the richest kind, its treasure of a so-called pagan altar, embossed with fighting warriors, its three pyramidal domes, so unexpected, so sinister, which I have not met elsewhere, in church architecture. Henry James, A Little Tour In France. 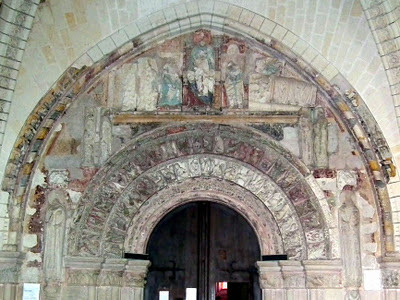 Henry James called it correctly: the narthex of St-Ours in Loches is indeed impressive. 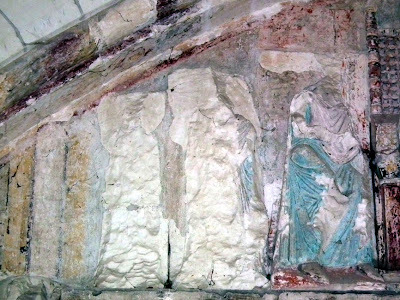 A narthex, or porch, is traditionally where people who were not communicants of a church could stand outside the church, but still under cover, to hear the sermon. 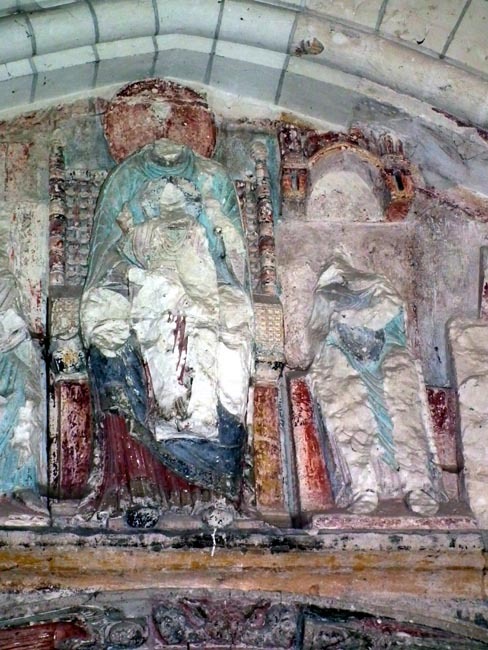 There was usually also a font, so that people could be baptised symbolically on the journey into the church. 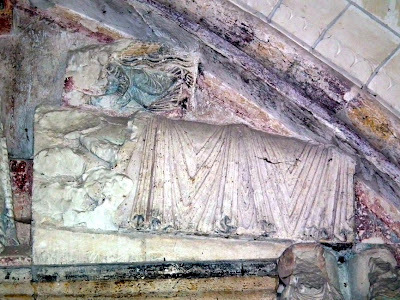 The doorway into the church proper is surrounded by a fully carved 12th century nativity, with some interesting touches. baby on her knee, and Joseph on the right. and also to the right, asleep (under the same blanket!) and being visited by an angel who is warning them not to visit King Herod and also of the coming massacre of the innocents. The angel is in blue, hovering above the nicely carved blanket which covers the recumbent Magi. If you're ever in Loches, follow in the footsteps of Henry James (and us) and visit the porch of the church on the hill - don't forget also to call in to see the tomb of Agnes Sorel. When I was in London last week I took quite a few photos. 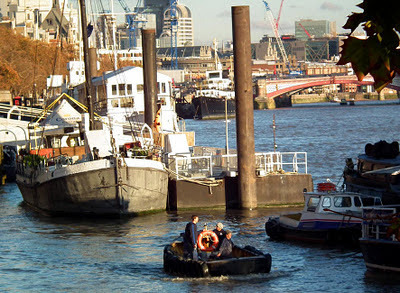 These are three of my favorites, and all of them are photos of the River Thames. The first gives a very small idea of what the Thames must have looked like 50 years ago. 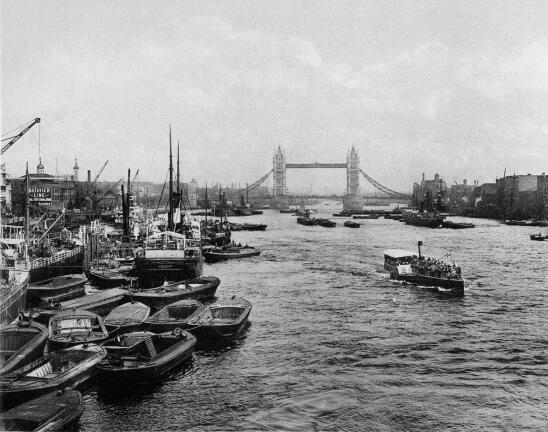 In those days large boats were still travelling up river to disgorge cargo from around the world, some of them travelling as far as the Pool of London, between Tower Bridge and London Bridge. 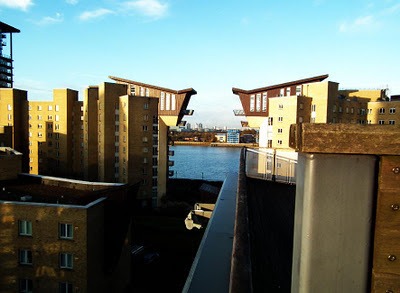 In its full glory it looked like this, now almost no seagoing vessels venture this far upstream. 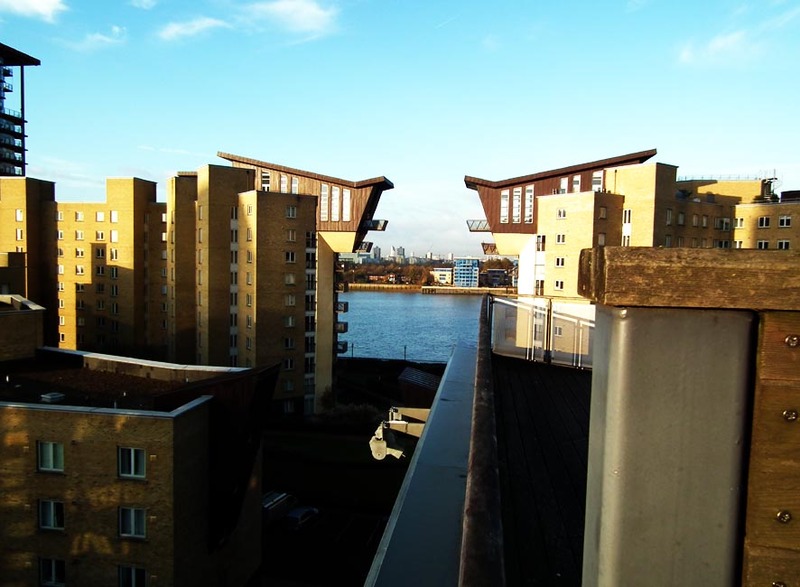 The second photo is from the balcony of the apartment my brother rented in Canary Wharf. 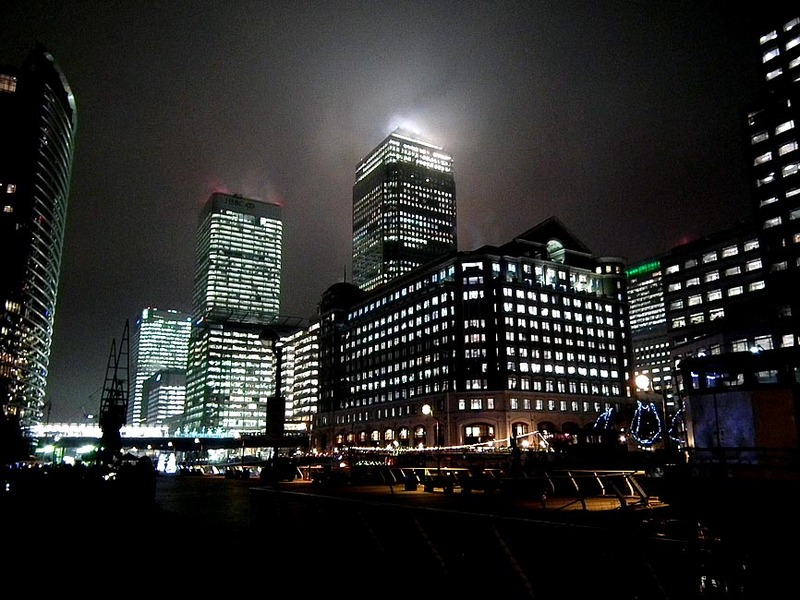 As much as I do not like Canary Wharf and its associated shopping hell, it has to be said there are some good views to be had. 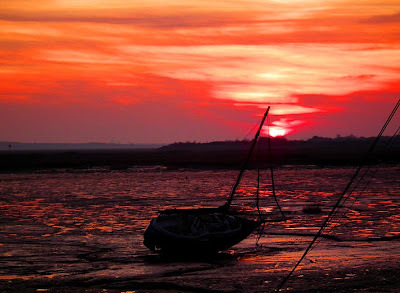 The third photo was taken at Leigh on Sea, late on Sunday afternoon. 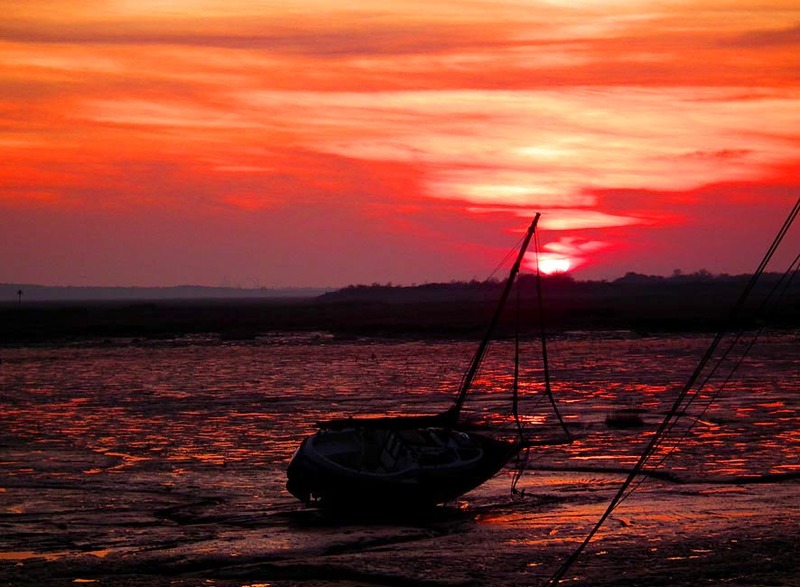 Leigh on Sea is famous for cockles, so Uncle Geoff and I decided to be true East Londoners and promenade along the waterfont eating shellfish from a bag. I wrote about a month ago that we were making a niche in the wall of the staircase. This is to allow us to display some of the stuff we have accumulated over the years. 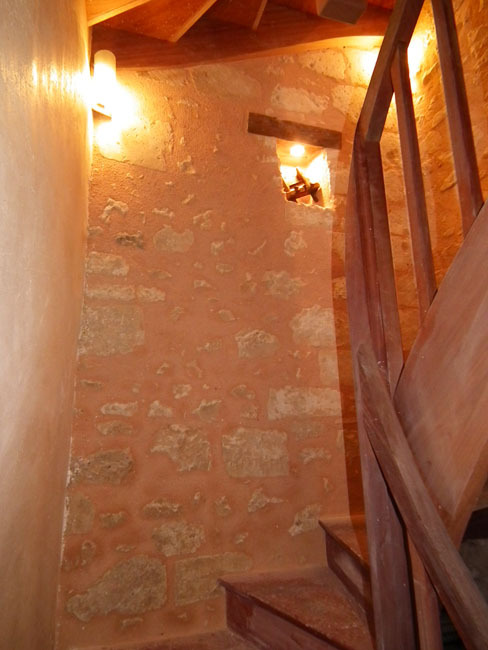 Now that the walls of the staircase are finished we have installed the lighting, which makes the stairs a bright and attractive place (and safe! ), and put the first item in the niche. This is a late 19th century plough plane - a router for cutting grooves. It was Susan's great-grandfather's and arrived here a week ago. 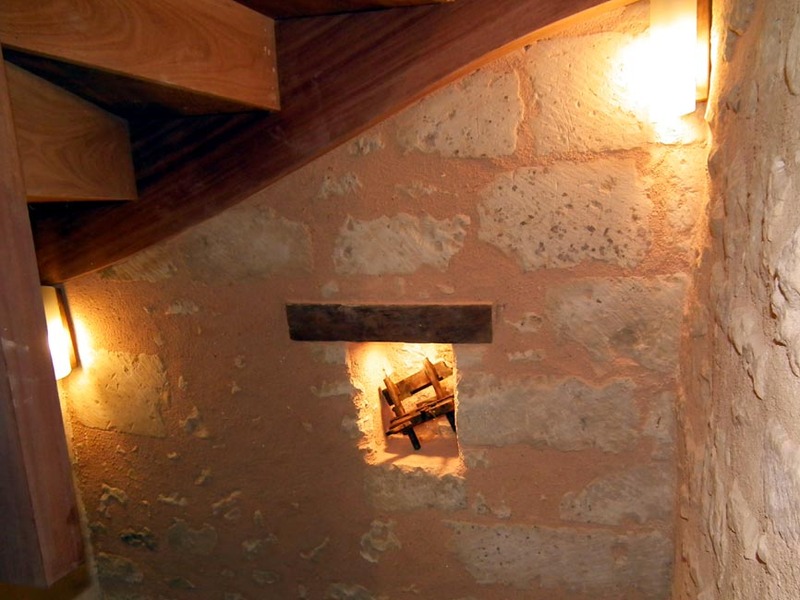 I am really pleased with the whole thing: walls, niche and lighting. All we need do now is sand and varnish the stairs and that part of the job is finished. here is what you're missing. On the Monday before I went to London we were working, and we managed to visit a new place for us, The pile of Cinq Mars. This is a bit of a mystery: a 2nd century Roman (or at least Gallo-Roman: that is built by locals who wanted to show how Roman they were) tower. 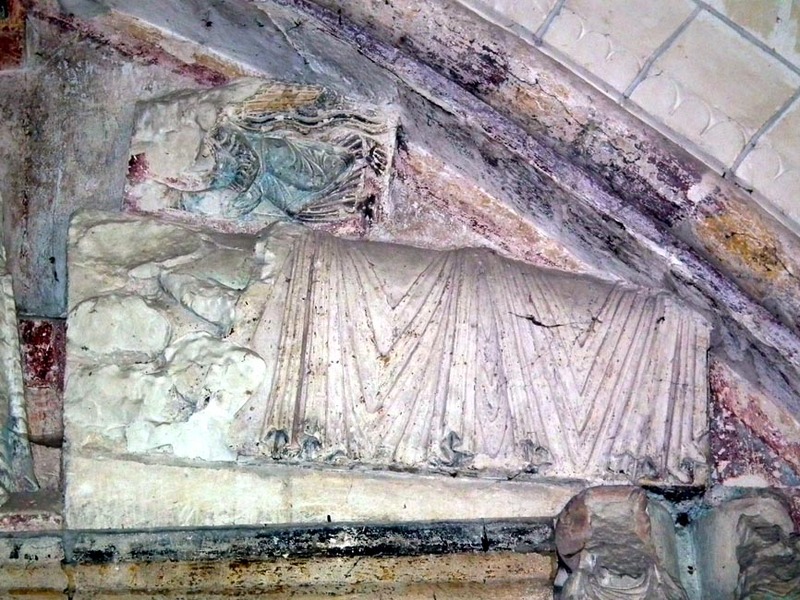 No-one is quite sure what it is - or was - although a funerary monument is the current front runner. Made of brick and standing exactly 100 roman feet (29.4 metres) high, it sits overlooking a bend in the river Loire at Cinq-Mars-la-Pile. 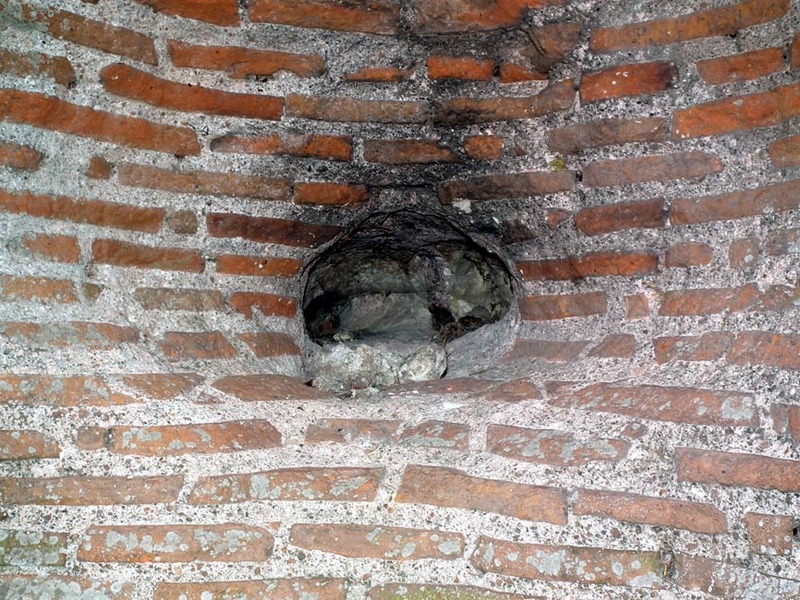 It contains about 100,000 bricks surrounding an infill of rubble, which can been seen in various places where we assume treasure hunters have been at work. 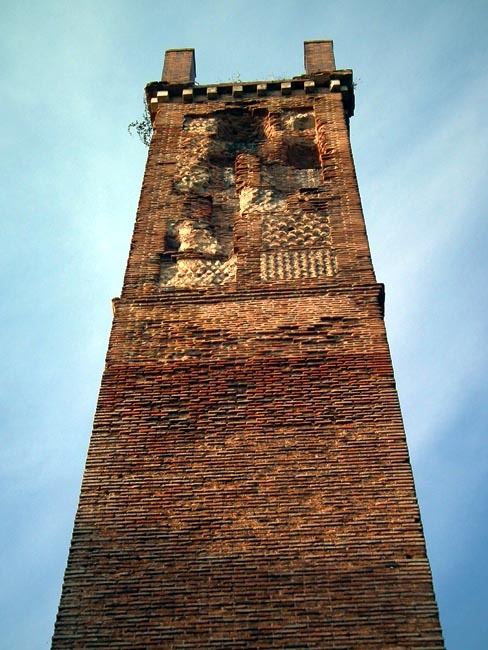 At the top on the tower and facing the river are twelve decorative panels, patterns of brick and cut stone. 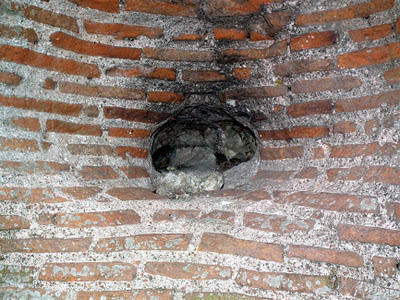 These are more commonly found in buildings in Ostia, the port city of Rome, and may give some indication of the background of the person who had the monument built. little more or less than every whit as great as the steeple-pillar of St.
upon the ears of corn. 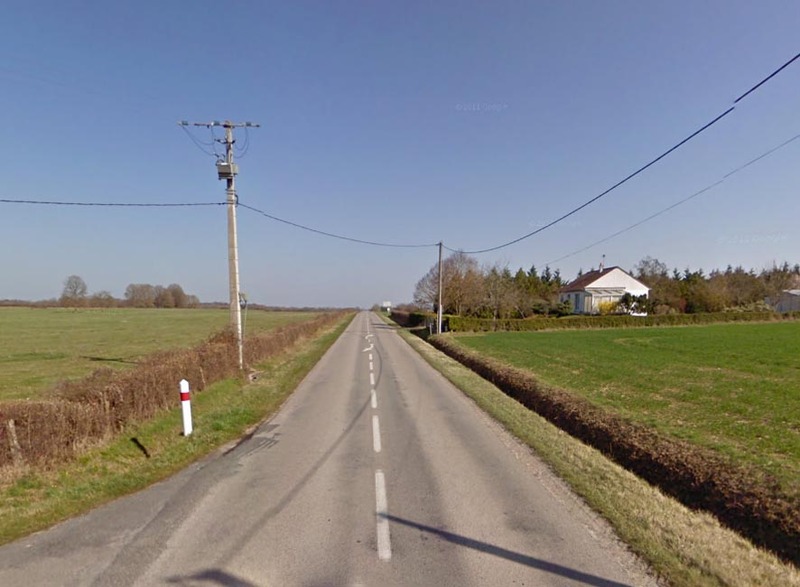 When I left my parents standing in a queue at Charles de Gaulle airport on the 10th of July 2011, I didn't expect that I would be seeing either of them any time soon. Sometimes fate takes a hand in matters, and in this case it was not good news. 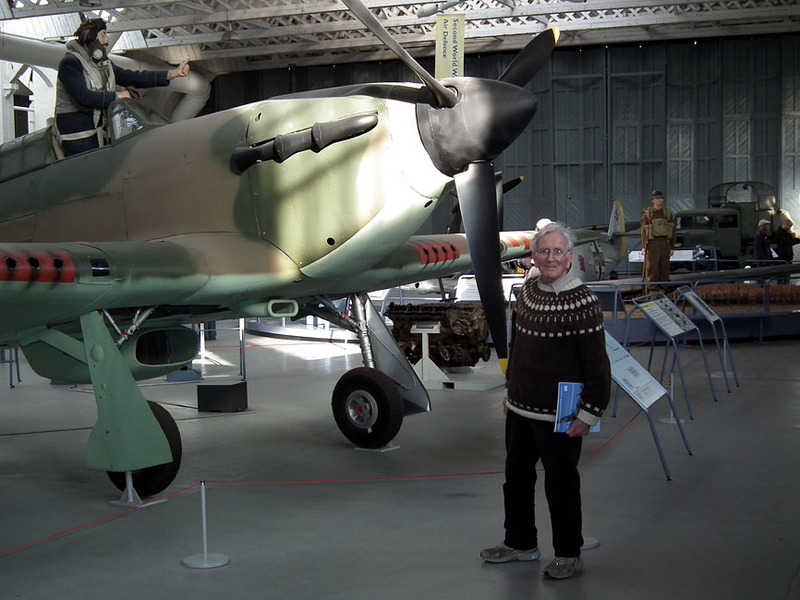 My father's brother had become seriously ill, and on Saturday 5th November he died. Dad immediately said he wanted to attend the funeral (naturally) and so almost a week later he arrived in London, accompanied by my brother and his wife. 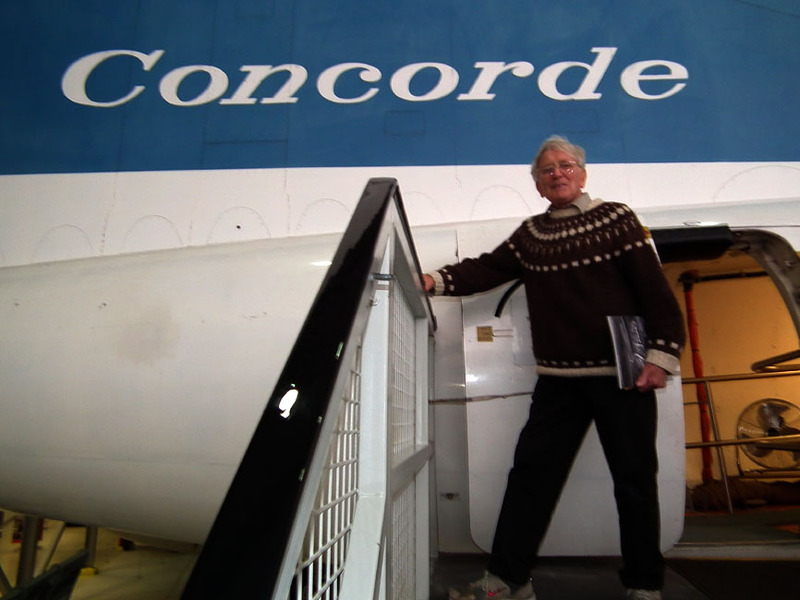 Susan and I were working and so couldn't attend the funeral, but a couple of days later I caught the train from Tours to London so I could spend some quality time with my Dad. We did lots of stuff, none of it world changing, but really pleasant and quite relaxing. On Thursday we visited the city of London, calling in to see the collection at the Soane Museum before walking from Lincoln Inn Fields to Aldwych - via Westminster Palace. Along the way we tried to visit the London Transport Museum (placemark B - too expensive, we didn't go in), The Da Vinci exhibition at the National Gallery (placemark D - sold out) and the Banqueting Hall (placemark E - closed for a banquet). I did, however, manage to show him Brydges Place (placemark C - London's narrowest street, not marked on google) and the Roman Bath (placemark F, a misnomer). After that, we caught a Routemaster bus back to Tower Hill and then on to our accommodation. On Friday night Dad was leaving to return to Australia, but I hired a car and we filled in the day by visiting the Imperial War Museum at Duxford. A great Boys Day Out was had with hundreds of aircraft and lots of photo opportunities. The weather was really pleasant, amazing for November in East Anglia, and it was good to see some of the English countryside with my Dad, something we probably haven't done since I was 7. Peace and Love and Understanding? We arrived back at Heathrow in plenty of time to have a coffee and a chat, and then Dad was off on the plane (hadn't he had enough of them by now?). I hope we can have a repeat visit of that kind: short and full-on, blokes doing stuff. It is to be recommended. 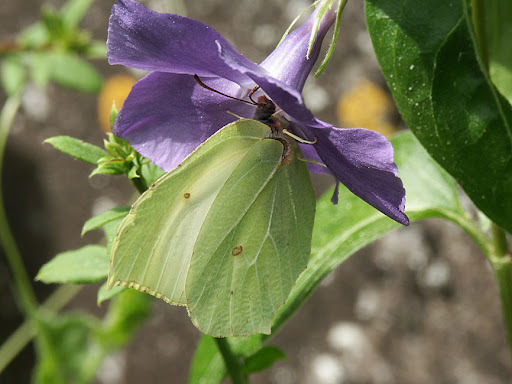 Over the past year I have been surveying the butterflies of the area as part of a scheme administered by the MNHN (National Natural History Museum). 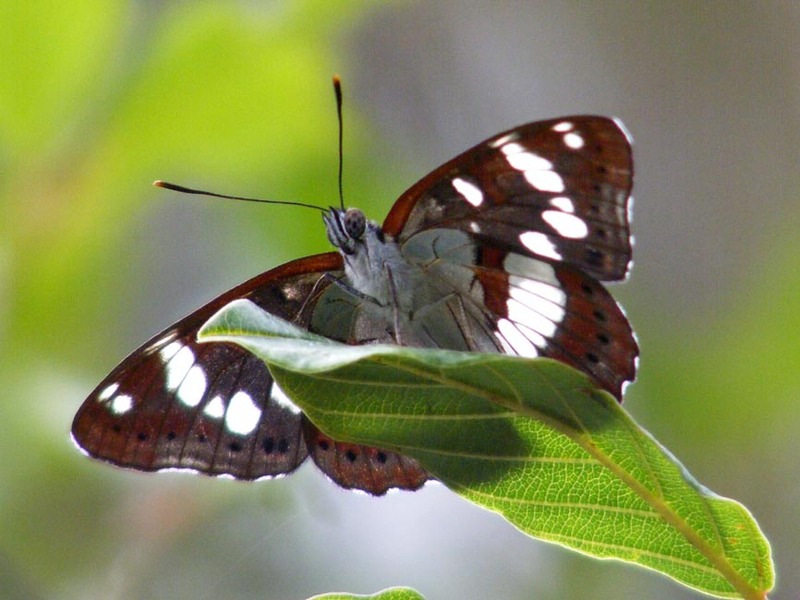 I have two 2km squares randomly allocated and I walk 5 short routes in each once a month between April and September, counting numbers and species of butterflies. 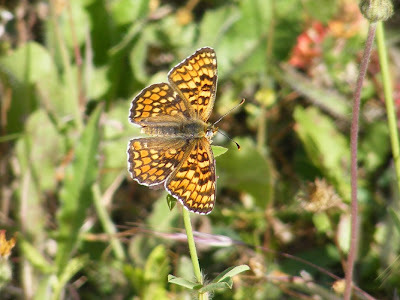 Violet Fritillary, on a violet. 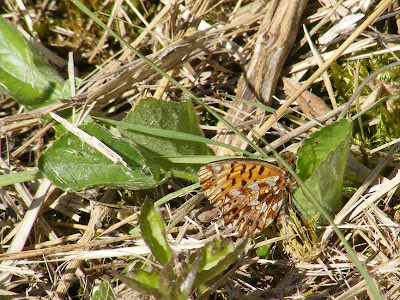 It has proved to be a fascinating exercise and a great way to get to know the local habitat through the seasons. This year we had an exceptionally dry and warm spring and a warm and somewhat wet summer. This has resulted in some winners, mostly woodland species, and some losers, mostly grassland species. 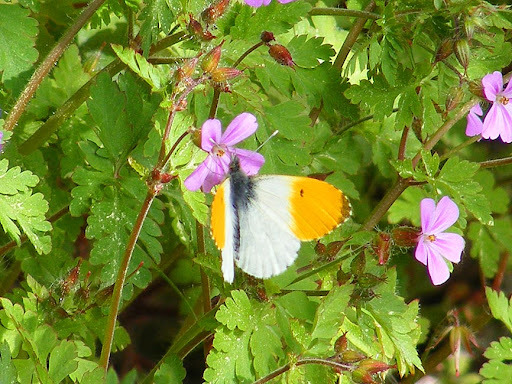 Some species have occurred in exceptionally high numbers, such as Orange Tips Anthocharis cardamines (l'Aurore in French) in the spring and White Admirals Limenitis camilla (le Petit Sylvain in French) in the summer. Some species have been shockingly absent - I didn't record a single Speckled Wood Pararge aegeria (le Tircis in French) on any of my transects, yet this is normally a very common woodland butterfly. 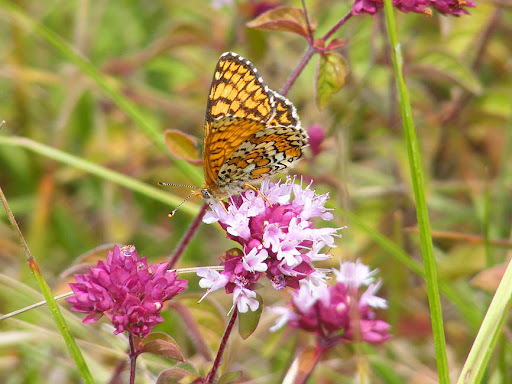 My beloved Glanville Fritillaries Melitaea cinxia (la Mélitée du plantain in French) seem to have been badly knocked by the dry spring, but their close cousins the Knapweed Fritillaries Melitaea phoebe (le Grand Damier in French) did very well. 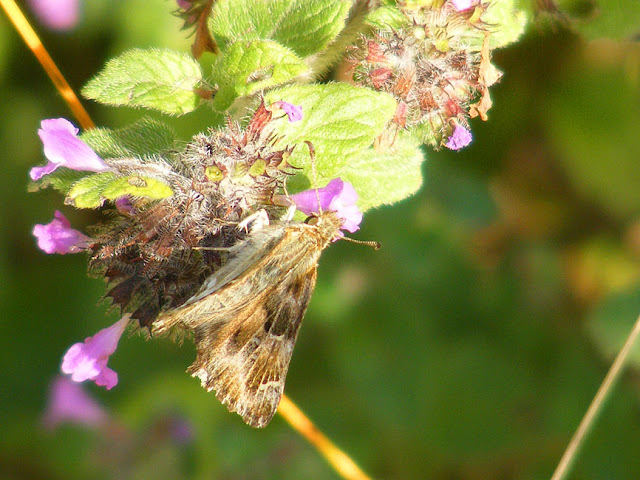 It seems to be a difference in caterpillar food plants, with the Speedwell that the Glanvilles need in the late spring being greatly reduced by the dry weather. 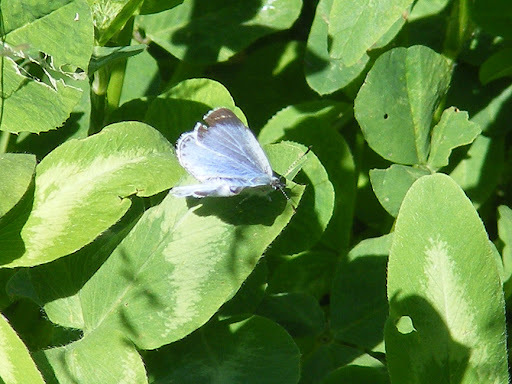 The Lycaenidae (Blues) have mostly had a poor year, with very few Holly Blues Celastrina argiolus (l'Azuré des nerpruns in French) in the spring and low numbers of Common Blues Polyommatus icarus (l'Argus bleu in French) and Provencal Short-Tailed Blues Everes alcetas (l'Azuré de la faucille in French) in the summer. 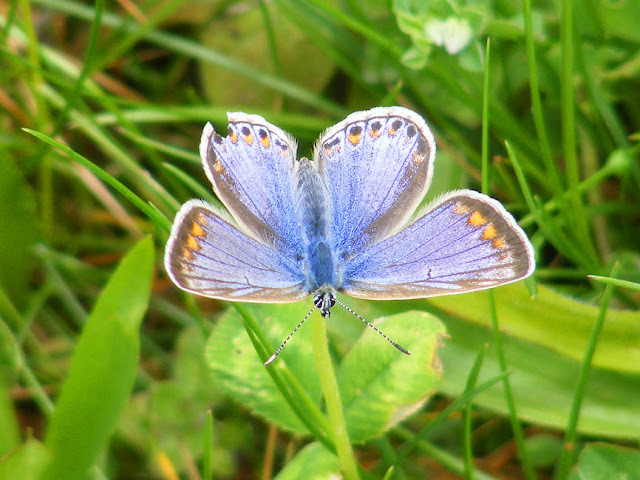 Happily, the rare Large Blue Maculinea arion (l'Azuré du serpolet in French) seems to have had a good year and I observed them on several occasions, including an egg laying female. 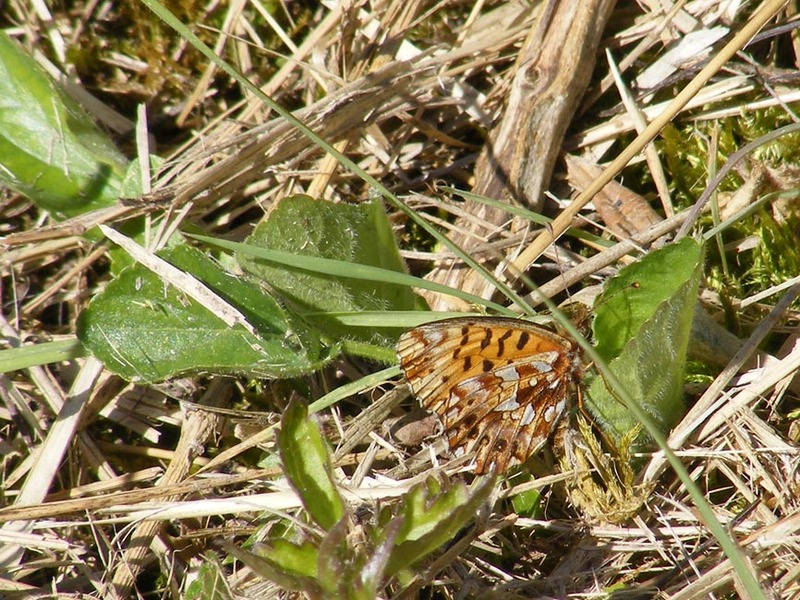 I observed 45 species in total and 1417 individual butterflies while surveying. 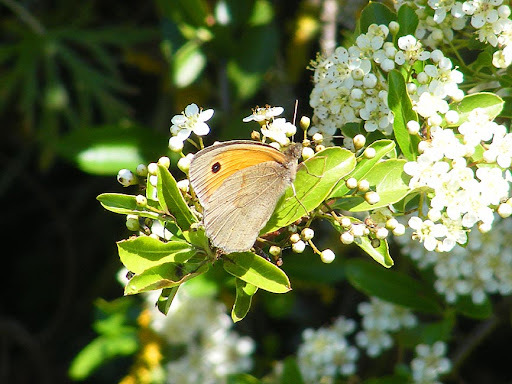 The most abundant species overall was the Meadow Brown Maniola jurtina (le Myrtil in French), which also topped the monthly bills for May and August. 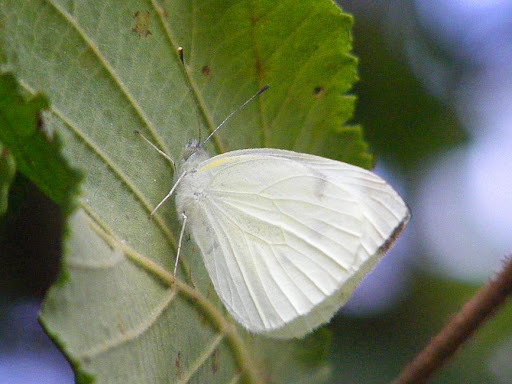 The most abundant species in April was the Brimstone Gonepteryx rhamni (le Citron in French), June was heaving with Marbled Whites Melanargia galathea (le Demi-deuil in French), July was the time of the Gatekeeper Pyronia tithonus (l'Amaryllis in French) and in September the Small Whites Pieris rapae (la Piéride de la rave in French) came into their own. There were a number of species that I only saw one each of: Mallow Skipper Carcharodus alceae (la Grisette in French), Large Chequered Skipper Heteropterus morpheus (le Miroir in French), Purple Hairstreak Neozephyrus quercus (la Thécla du chêne in French), Sooty Copper Lycaena tityrus (l'Argus myope in French) and Dark Green Fritillary Argynnis aglaja (le Grand Nacré in French). 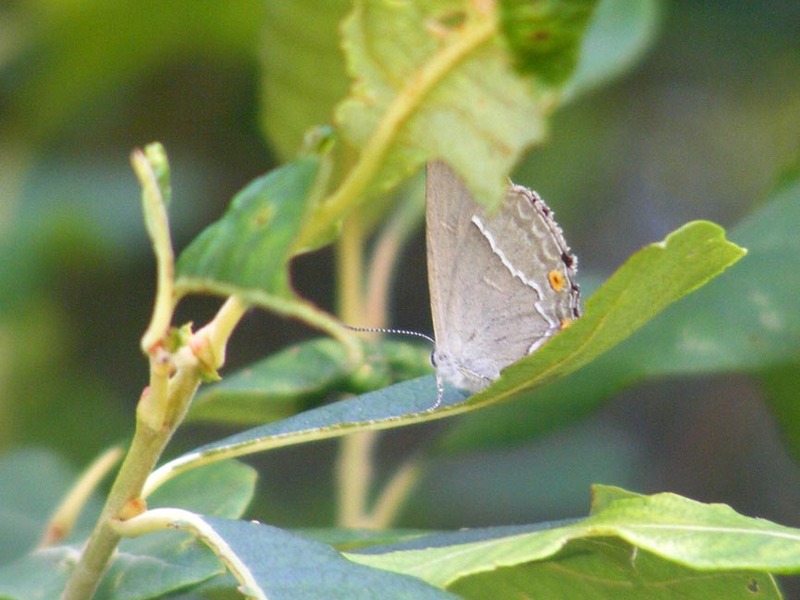 Sometimes only seeing a single individual in the survey is just bad luck - I saw normal numbers of Purple Hairstreaks and Sooty Coppers in the course of my daily observations outside the restrictions of the survey. I also saw Mallow Skippers, but felt that their numbers might be a bit low this year. 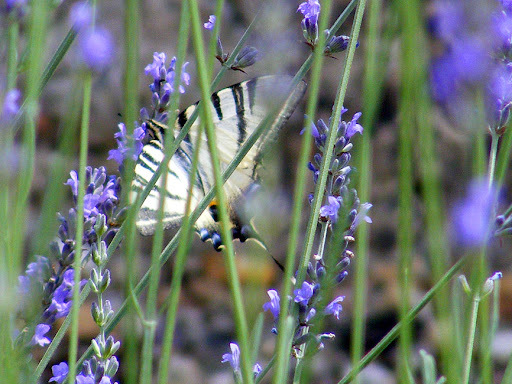 I recorded no Scarce Swallowtails at all while surveying, but saw them regularly in the summer. 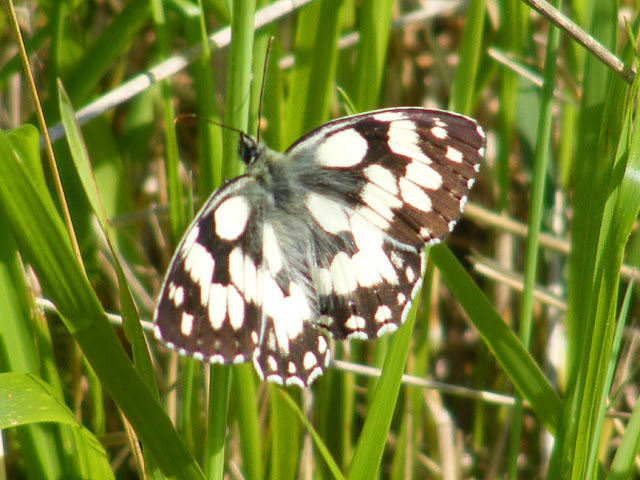 The reason for this is probably because this species is very much a garden (or orchard) butterfly, and my survey sites are cereal crop margins, limestone ridges, natural grasslands and forest rides. If you are interested in the complete species list I have updated the Loire Valley Nature butterfly list to show species seen on the survey in blue, but I have not given any indication of numbers there. It is five years ago today that this house became ours*, and just over two and a half years since we moved in. Because we bought just before winter kicked in (and Susan had caught a serious cold the day we bought the house anyway) it wasn't until April 2007 that we got around to installing running water and toilet facilities. This meant that we could stay in the house, camping in the salon. It was bitterly cold, but we were excited by the thought of having what was at that time basically a holiday home in France. 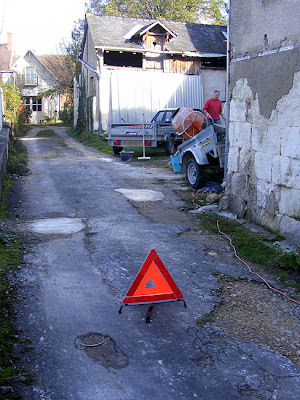 In September 2007 work on repairing the hole above the staircase and the graineterie roof started. 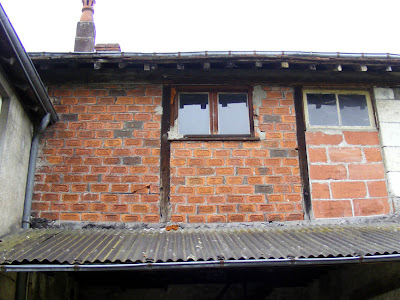 This was our first major works: previous to that most of the work done was cleaning and demolishing stuff, something I have got really good at over the years. February 2008 saw the introduction of electricity to the house. When we bought the house there was an electricity supply, but it was extremely feeble and a bit (well, a lot) haphazard. It took EDF 18 months to get around to visiting and changing the supply to single phase power that was usable. 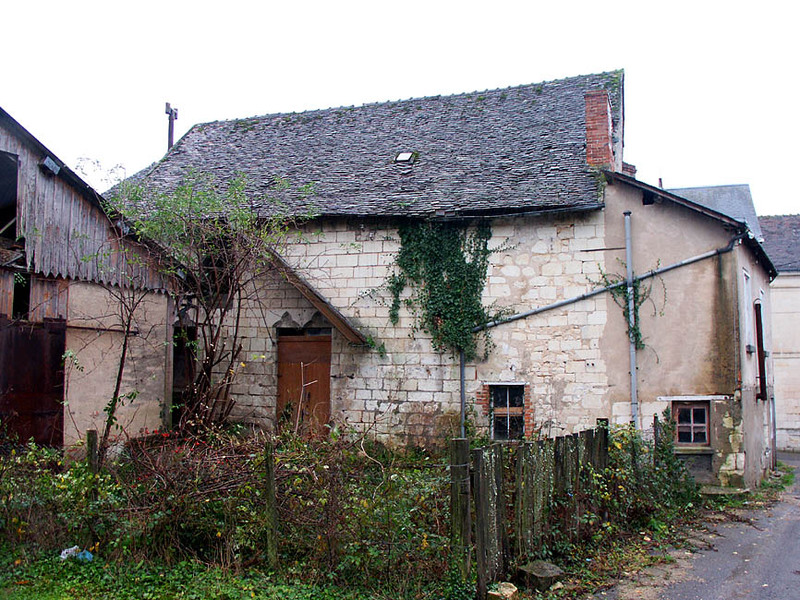 In July 2008 we shifted the old bathtub, which was fun (if a bit scary), then in September we had our first house guests: Susan's sister and b-i-l visited and stayed in the house - all our previous visitors had stayed in either the Hotel l'Image, or in a gite. Or in Adrian's case, a caravan in the back garden. 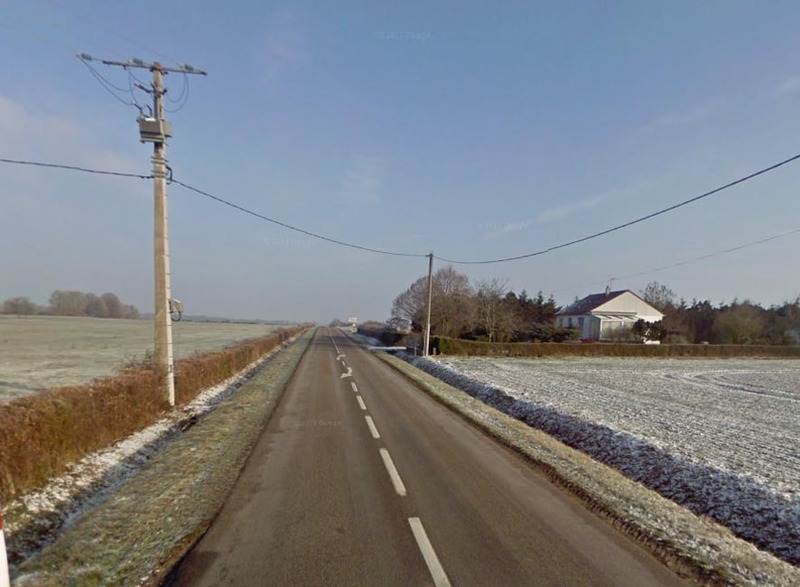 December 2008 was our first Christmas in Preuilly, and by jingo was it cold!! We survived by wearing every item of clothing we had in France and eating well. A month later, and my house in Australia was finally sold, which allowed us the freedom to set a date for moving to France. In June 2009 we had the first signs of bathing in a civilised manner, and July was staircase month. In October the fireplace and chimney went in, and life was really beginning to get comfortable: not only were we no longer living in one room (the salon) we could wash and stay warm! Since then work on the house has continued more or less non stop. In the past two years we have insulated the whole house, built two bathrooms and a kitchen and put in electricity and proper plumbing. In the garden we have a fence and gates to make it look like a proper garden, and somewhere nice to sit when the weather is good. The house itself has been re-roofed, the walls given a frame to stop them falling down, and varous windows have been replaced. We have made friends, bought an orchard, Célestine came into our lives, and we started making an income. *you can tell how new we were to blogging - even this momentous event took us two months to report. A new street goes in. The local council is developing a parcel of land up on the ridge behind the chateau and close to the road to Loches. 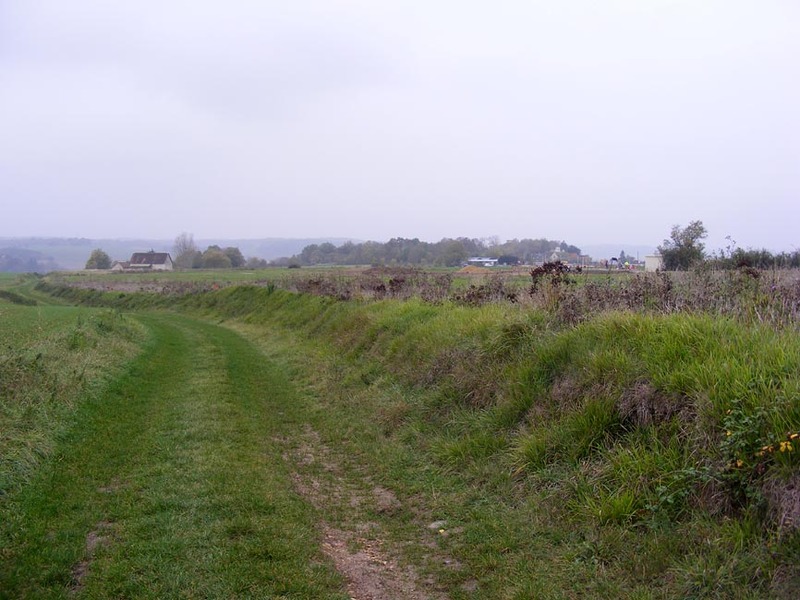 Previously the land had been ploughed and the farmer who owned it grew crops such as wheat. Soon it will be housing blocks, including some for supported housing, and a new police station. 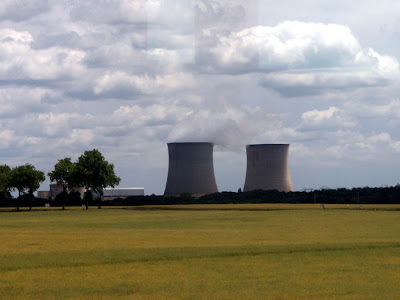 from one of the rural routes. 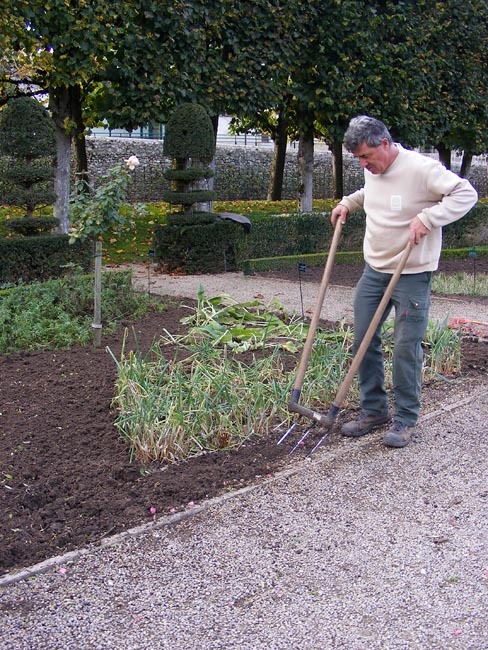 When I was at Villandry the other day I spotted one of the gardeners using a very nifty tool. It looked just the thing for the soil in our argilo-calcaire (clay-chalk) vegetable garden so I stopped to talk to the gardener and ask about the tool. 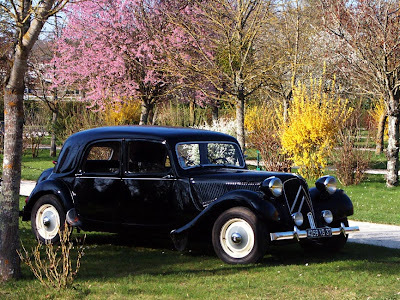 He told me it is called a fourche-bêche, or sometimes a grelinette, after the inventor, André Grelin. Far from being homemade, as I had assumed, they are available commercially, so when I got home I looked them up. They are very popular in the organic movement because they cause the minimum soil disturbance and take very little effort to use. I'm completely sold, and if I get any birthday money (hint, hint...) I will be buying one of these (they cost a bit over €100 if you buy them online and have them delivered from the French manufacturer Ducoterre). According to their blurb they are ideal for difficult soils, allowing them to be worked without damaging the soil structure or straining your back. They are also good for working compost into the soil, harvesting root vegetables and weeding. Apparently they are called broadforks in English. 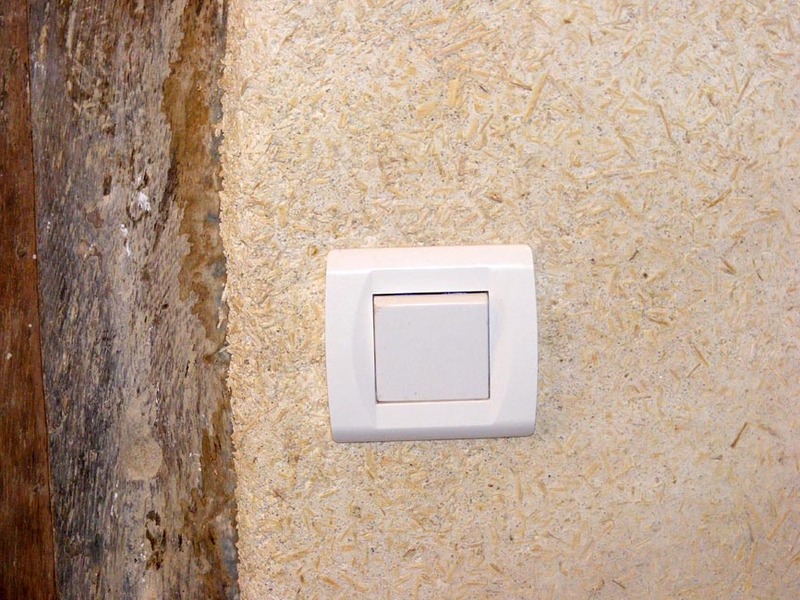 This is what our light switches look like. They are not LeGrand, the brand we had the catalogue for and who do all sorts of snazzy switches. 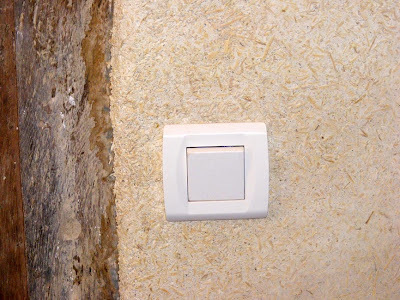 In the end, we went for switches that are a quarter of the price because we felt that the difference in price between these ones and the LeGrand range was not reflected sufficiently in the difference in design and quality, and we had a lot of switches to buy. These ones are Norvika, from BricoDepot, and when I see this one neatly installed on its new chaux-chanvre (hemp render) wall on the staircase by the spare bedroom door, I feel nearly as happy as when my back door mat was installed. There are pockets of clay all over the Touraine and Berry and in the old days (i.e. 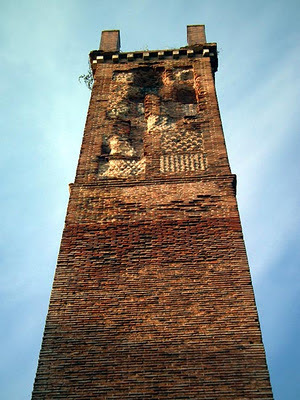 the 19th century) there were tile and brick factories associated with almost every town and village. 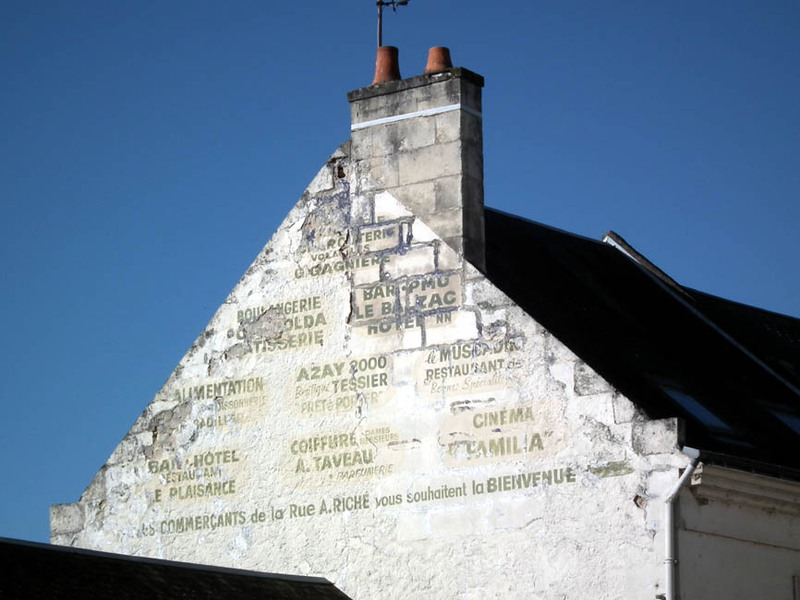 They are virtually all gone now, with a rare survival being the tile factory near le Blanc where we got our carreaux de terres cuites for the kitchen and entry hall. 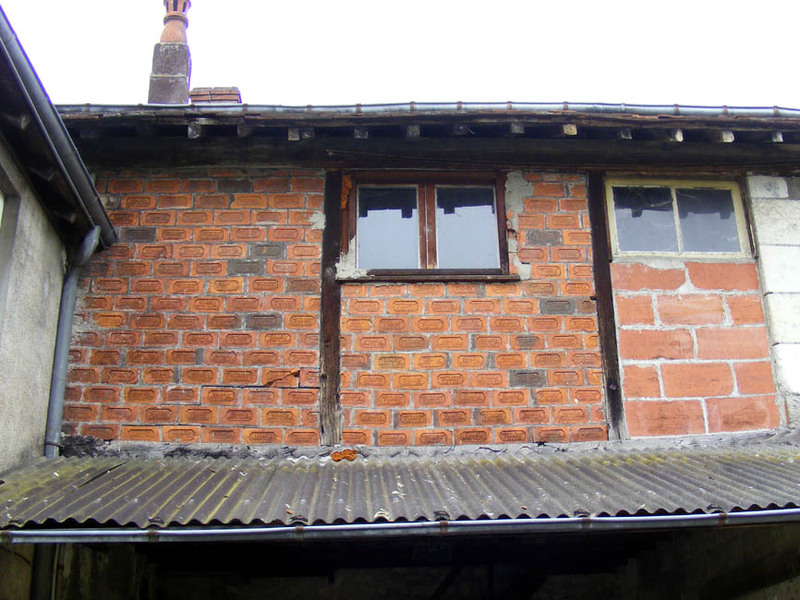 We have a few old examples, with original terracotta tiles in situ on the pantry floor, and the odd brick randomly placed in the shoddily built extension to the back of the house. 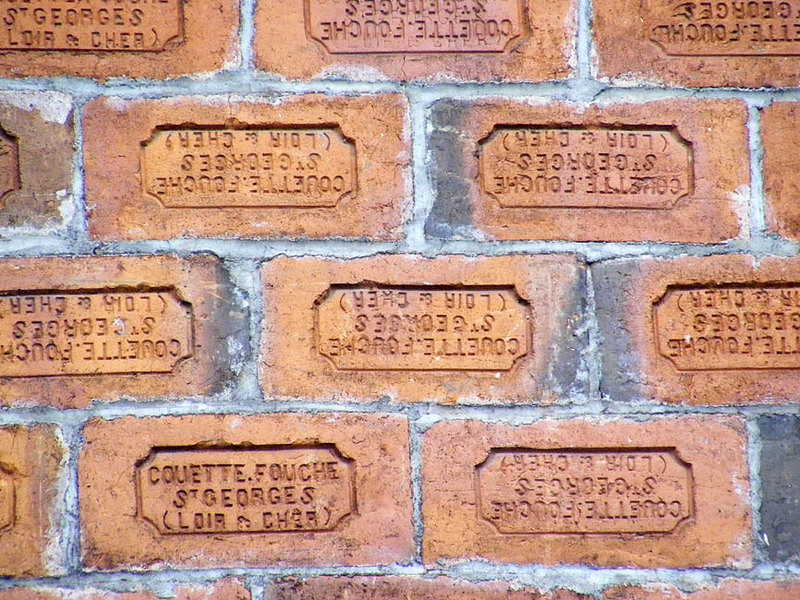 The bricks are all stamped with the names of their manufacturers and the town they were made in. 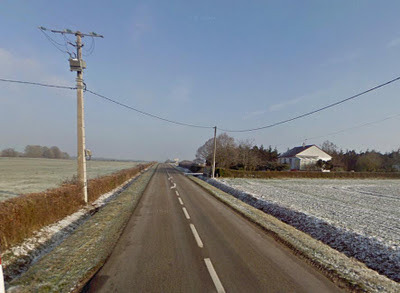 We have bricks from Preuilly and nearby Chambon, a village little more than a hamlet. is not much better than at our house though. 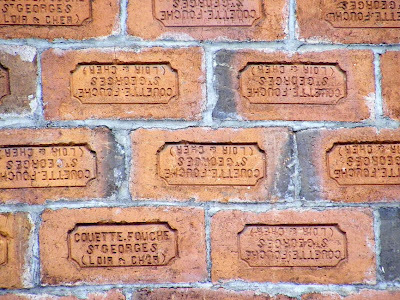 We happened to duck down a path in Saint-Georges-sur-Cher one day recently and discovered a particularly impressive array of local bricks. Old bricks and tiles like these, with their distinctive stamps, are a very accessible reminder of local history, and have become minor collectors items. I've seen roof tiles for sale at brocantes, with those bearing the name of the town the brocante is in displayed most prominently. 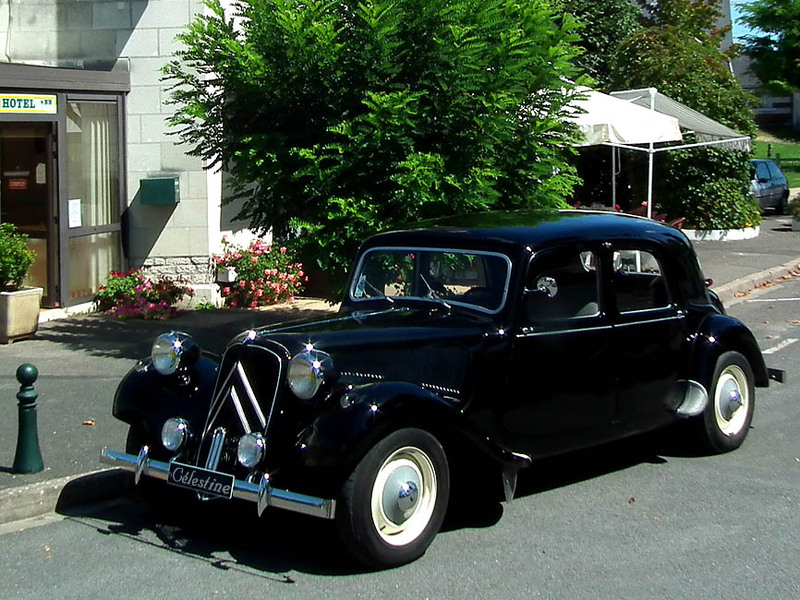 I seriously considered buying one at Preuilly's brocante, as a nostalgic souvenir of past times. 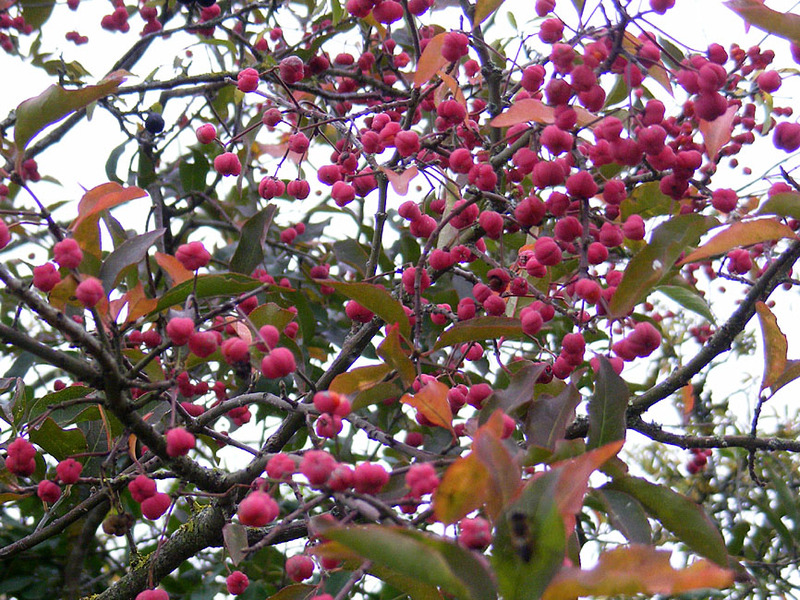 The Spindle Euonymus europaeus is a small deciduous tree, usually only a couple of metres high. The flowers are small and cream, the leaves go orange in the autumn, but its real glory is its seedpods in the autumn. 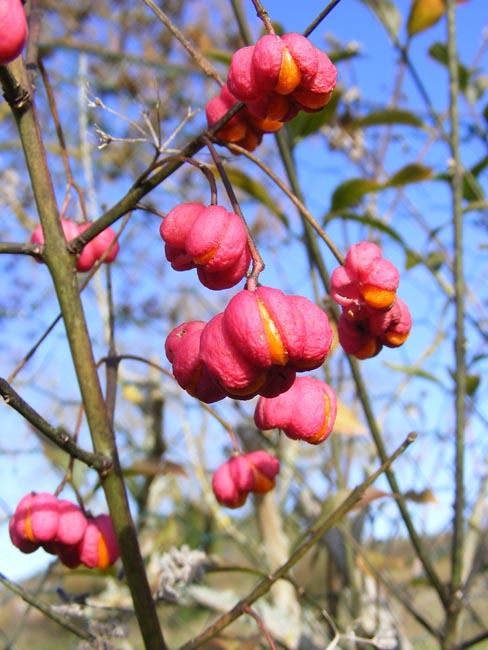 They are the most luscious coral pink, and open up to reveal bright orange fleshy seeds. The seeds are attractive birds, and the tree grows anywhere the birds take them - hedgerows, woodland fringes or fence lines where the soil is chalky. The wood is extremely hard and as the name suggests, was once used to make spindles, for spinning wool while you walk, talk and think of other things. Because of its fine grain and the ease with which it can be split, it can be sharpened to a thin point and was used to make toothpicks, knitting needles, arrows and skewers. Apparently it was also used to make birdcages. I was told recently that it makes the best artists charcoal, and this seems to be the one use for this wood that has continued into modern times (although a quick check of the internet revealed that it is not at all easy to get - almost all artists charcoal seems to be made of willow these days). It's the sort of thing an enterprising and determined artist could make for themselves though. The French expression for charcoal sketch is dessin au fusain. This shows you how closely associated with artists charcoal the plant was, at least in France - the French name for Spindle is le fusain, and the word is now a generic term for artists charcoal, even when it is made from willow. 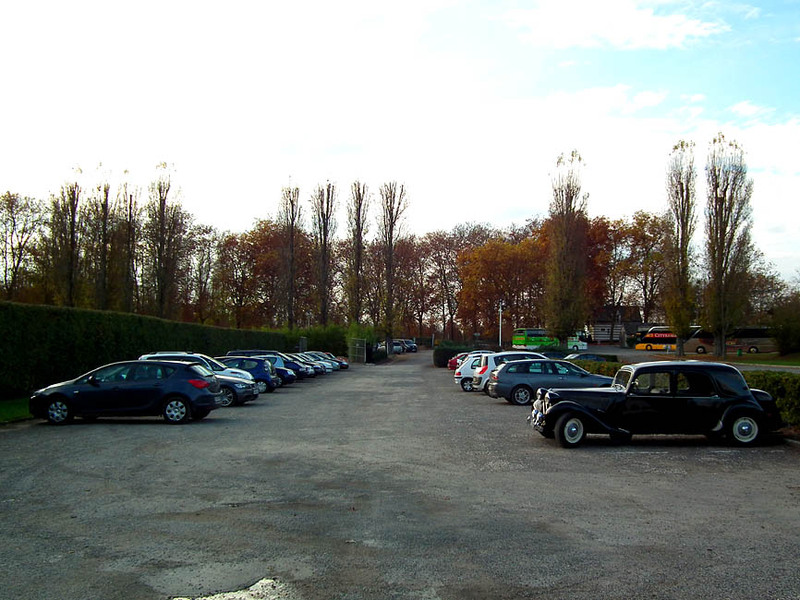 ... the car park at Chenonceau. Today I will be sitting in the car park at Chenonceau for the 21st time this year. 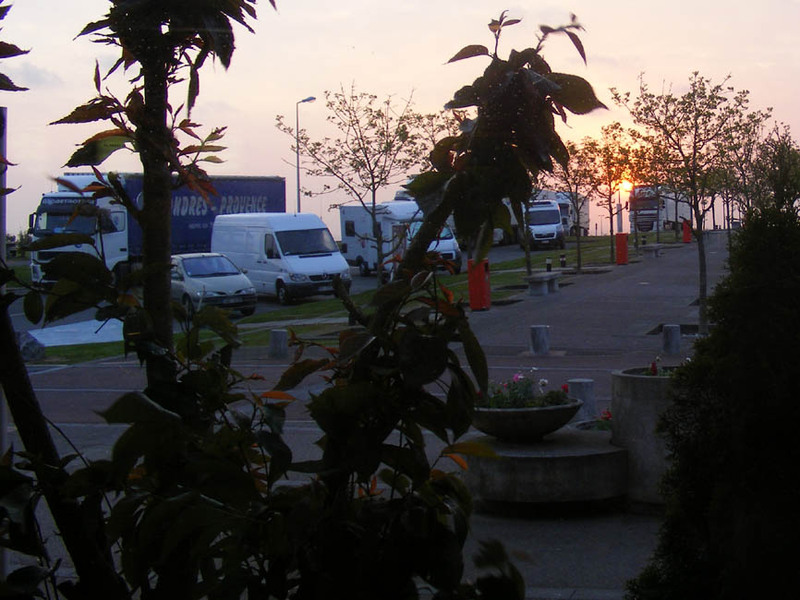 The first time was on the 24th of March, when spring was very much in the air. The most recent time was last Thursday, the 10th November, when clouds were gathering, the evening was drawing in, and the main carpark (which I have photographed so many times) was shut. 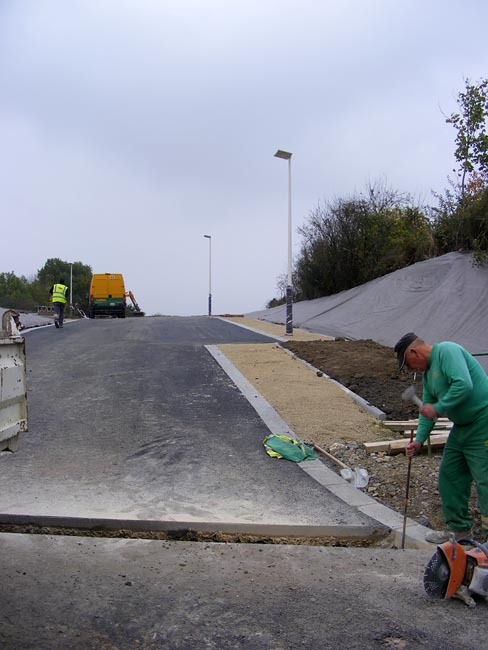 Over the past eight months the surface of the main car park has become very rutted and large puddles formed. Although summer this year was very wet we have been extremely lucky and never visited the chateau in the rain, but you could see the damage that large numbers of cars can do to a gravel surface if conditions aren't right. 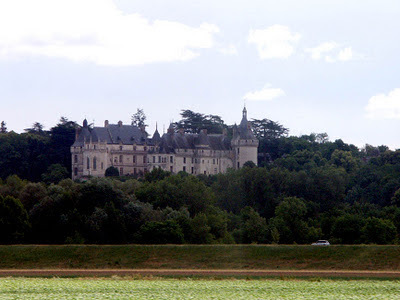 We won't be at Chenonceau again until March next year, so you will just have to wait until then for updates on this very important (and very popular) site. 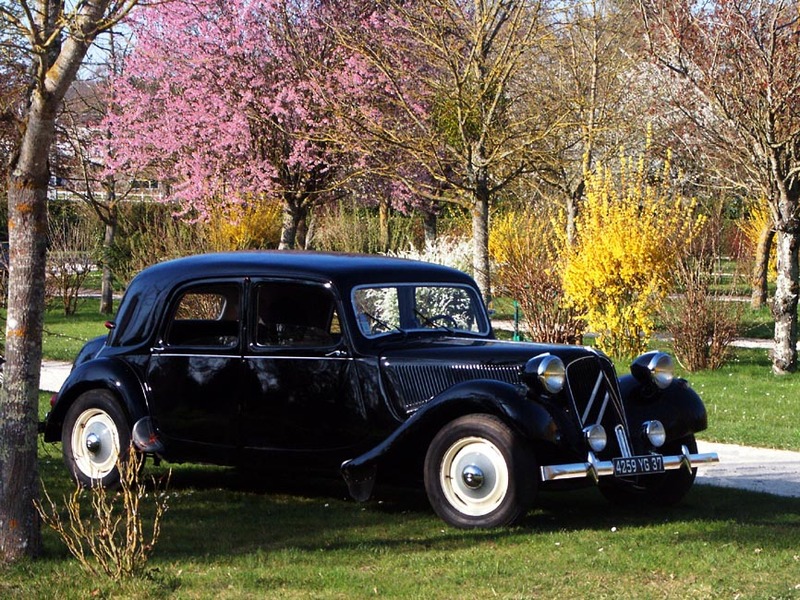 Known in France as the "été de la Saint-Martin", this refers to a lengthy period of warmth after the first frost of the year. This year we are having an été de la Saint-Martin, the first frost of the year being in mid October, but the past five or six days have being almost t-shirt weather. St Martin's day is 11 November (so it kind of gets obscured by Armistice day) and this is traditionally the day on which a St Martin's summer become "official". St Martin of Tours died in Candes st Martin on the 8th of November between 395 and 402AD, but according to the Catholic Encyclopedia no-one is sure of the exact year. He was loved and respected by many people, so a bit of a fight developed over the resting place of his body, which was seen as a great marketing opportunity: wherever had the body was sure to be a place of pilgrimage. 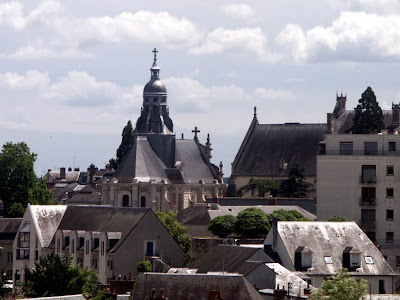 In the end the body was "pilferred" (their word, not mine) by the cathedral at Tours, and as the body travelled the 20 miles or so up the Loire to its new resting place the flowers and trees along the banks of the river burst into flower. In England they are having what they now call an "Indian Summer", with reports of spring bulbs flowering, but until the middle of the 20th Century it also was known as a "St Martins Summer", the American term for it being only a recent introduction. We expect this unseasonal season to end soon - Wednesday is meant to be overcast, if not rainy, but until then we are making the most of it! Earlier this year our Australian friend Liselle was leading a tour group in Corsica. 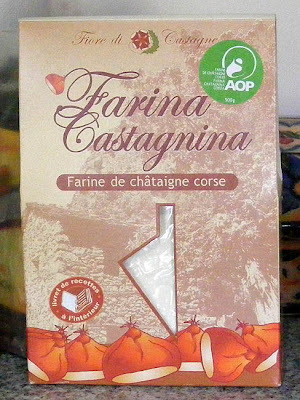 After the tour was over she took the opportunity to stay with us for a week, and she brought with her some Corsican chestnut flour as a gift. In the old days chestnut flour was a staple food of the inhabitants of Corsica, and today it is one of the stars of Corsican gastronomy. The area the Sweet Chestnut Castanea sativa is native to covers the Mediterranean basin, but it is Corsica that is historically most strongly identified with the production of chestnut flour. 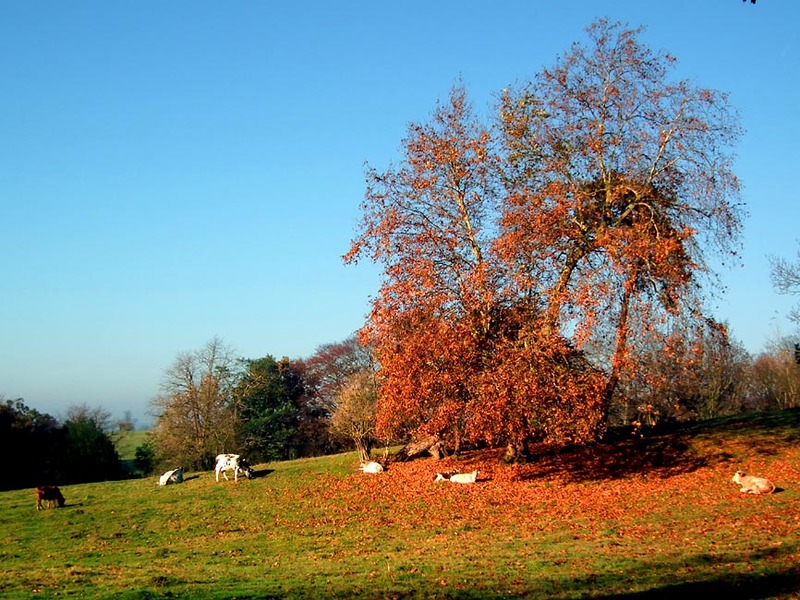 For hundreds of years, Sweet Chestnut growers have selected the sweetest varieties and perpetuated the cultural knowledge to create a great delicacy. Chestnut flour is naturally sweet and incredibly fine. This allows the creation of many dishes, ranging from the traditional pulenta (a Corsican chestnut version of the Italian cornmeal polenta) to the more modern and exotic, like my Chocolate Chestnut Soufflé Cake. It is rich in vitamin C, low in fat and suitable for gluten free diets. Ideally, it needs to be kept in the fridge, and you need to sift it into your mix as it has a tendency to cake into little lumps. Chestnuts picked up in the carpark at Chenonceau. 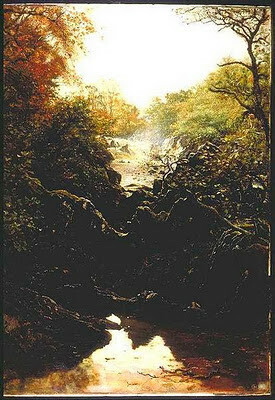 The Chestnut has been inextricably linked for at least 5 centuries to the life of the inland villages of Corsica. Today, chestnut growing is an essential component of safeguarding the cultural heritage, mountain economy and the ecology of the area. 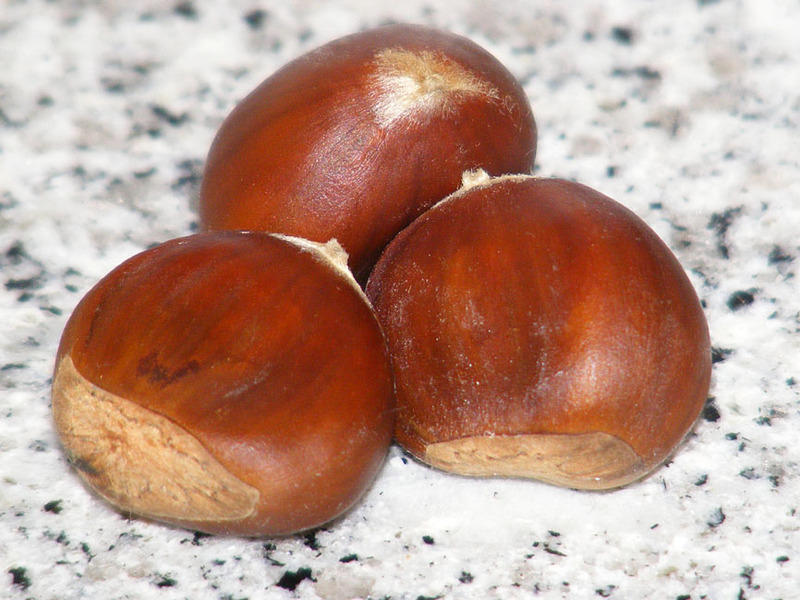 Harvested around mid-October and dried slowly, the chestnuts, belonging to several specific varieties, are shelled, then rigorously sorted and selected before being baked in wood-fired ovens and ground into flour. From their ancestral experience, the producers obtain a chestnut flour characterised by its sweetness, fineness and purity, with a smell and taste of dried chestnut and biscuits. Chestnut flour is fairly easy to get in France, with most good supermarkets stocking it. I have also bought it at Halles et Champs in Perusson. Every year the Maire receives the President of France's official Armistice Day speech to read at the local ceremony. This year the speech emphasised the need to acknowledge all those who have 'died for France'. With the death several years ago of the last of the poilus (the French First World War soldiers are affectionately known as 'Beardies' because of their often luxuriant facial hair), Nicolas Sarkozy has been introducing more and more references to other conflicts where French soldiers have died. He has announced a proposal to change the law, making it obligatory to have the names of all the fallen, whether from wars fought on the home front or overseas, carved on war memorials. The name of the memorial day will be changed to include tous les morts pour France. A new monument is to be constructed in Paris to commemorate those soldiers killed in overseas operations (154 in the last 10 years, 24 of those in Afghanistan in the last year). This change of focus has not gone uncriticised. Some people feel the sacrifices of the First World War, made on French soil for French people, will be sidelined. Francois Hollande, the Socialist Party candidate for the 2012 presidential election, says that Sarko is trying to manipulate history. Sarkozy's response is that 'those who have fallen in IndoChina, at Suez, in North Africa, but also in the Balkans, the Middle East, in Chad, in Ivory Coast and in Afghanistan have the right to the respect and honours that the Nation reserves for those who have sacrificed their lives for her'. After participating yesterday in the ceremony at the Arc de Triomphe and tomb of the unknown soldier, Sarkozy travelled to Meaux to open the new musée de la Grande Guerre. With the centenary of the start of the war coming up in 2014, this new museum will play a key role in the programme of commemorative events. In his speech Sarkozy took the opportunity to say that Europe is 'an enterprise of peace constructed on the blood spilt in three wars' which he 'intends to defend with all his might' as 'we have a duty to preserve it at all costs'. The first of August 1914! The sky was so blue on this evening in a beautiful summer; not the least cloud, no suspicion of a storm above the harvested fields...when, brutally, at the end of the afternoon, the bells of all the churches of Loches and district sounded out, slowly, heavily, with the sadness of a funeral bell...In the bustling streets there suddenly reigned an atmosphere of great sombreness. This time, it was war! After all the time we've waited! At last we are going to be able to retake Alsace and Lorraine! The chaps from Verneuil and Tauxigny, Beaulieu and Saint-Hippolyte didn't all leave with enthusiasm for their meeting with History, with death, but they left all the same, docile and resigned, singing and joking, undoubtedly to hide their emotions, and repeating over and over, all the better to convince themselves, that they would be back before autumn, to drink the new wine. 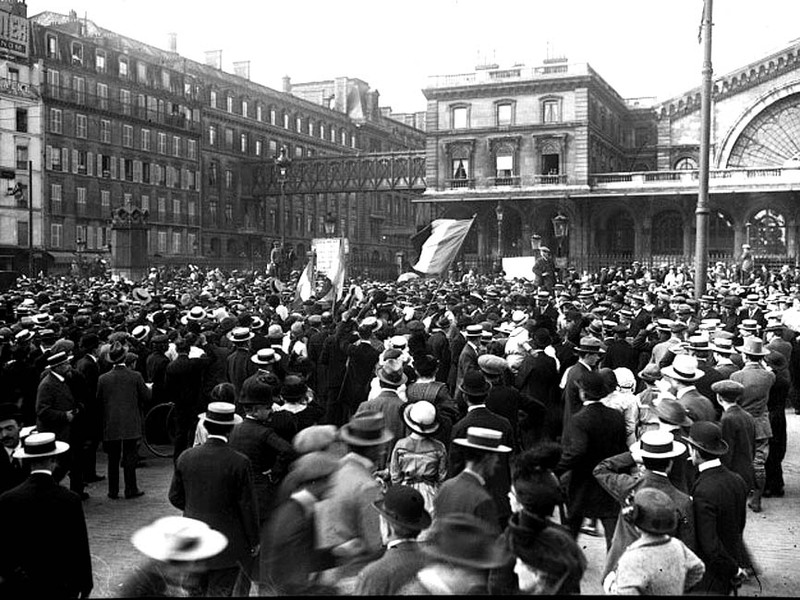 Mobilisation outside Gare d'Est in Paris, 15 August 1914. 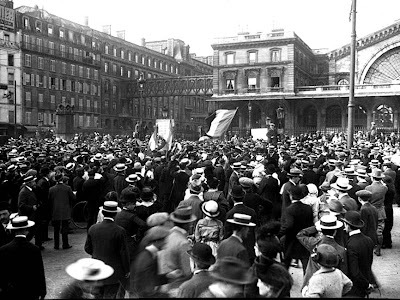 The first of August 1914! The sun set on France, on the district of Loches and on this time which, after the war years, appeared, in the memories of the survivors, so very Belle. Source: Translated from Le Pays Lochois à la belle époque by B. Briais. I particularly like this one, a trade directory of all the businesses in what is now avenue (but was then just rue) Adélaide Riche. All of these businesses are now closed, although the Hotel Balzac is for sale and could once again be a hotel one day. 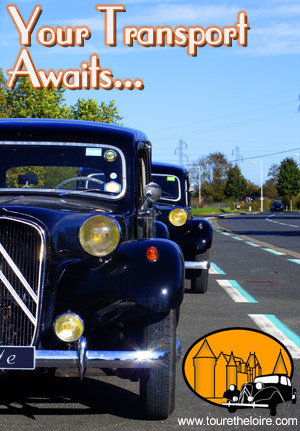 Writing about Tours station the other day reminded me that soon (well - in a couple of months time) Susan and I will be heading off to Paris again to visit Retromobile. In the past we have travelled to Retromobile by TGV, but the last two trips to Paris we have travelled by the scenic route. It takes twice as long but gives a much better view of France: chateaux and small towns rather than wide open plains and wind turbines. It is also a little cheaper, and because you can't reserve seats you can always get a ticket - as opposed to the TGV where once every ticket is sold, the train is full and no more tickets are sold. This means that even at very short notice you can get a ticket even if it means sitting on your bags in the corridor the whole way. Usually though, you get a compartment and privacy. We haven't yet started making plans for January (even we are not that organised) so we have yet to decide which train to take. 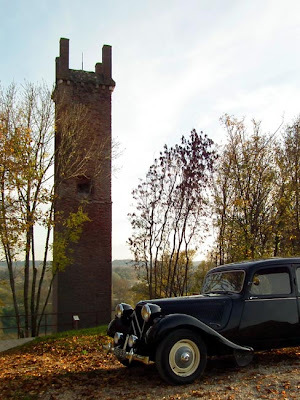 I still rather like the idea of travelling at 300km/h (186 mph), but the thought of a picnic whilst watching the scenery go past also holds appeal. One thing may sway it towards travelling on the TGV: recently I have seen TGV Duplex trains travelling across the bridge over the Loire river. 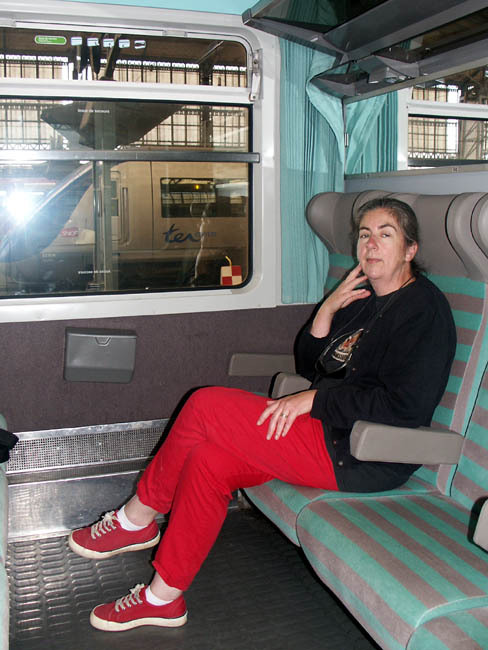 I have never been on a TGV Duplex, but would really quite like to. 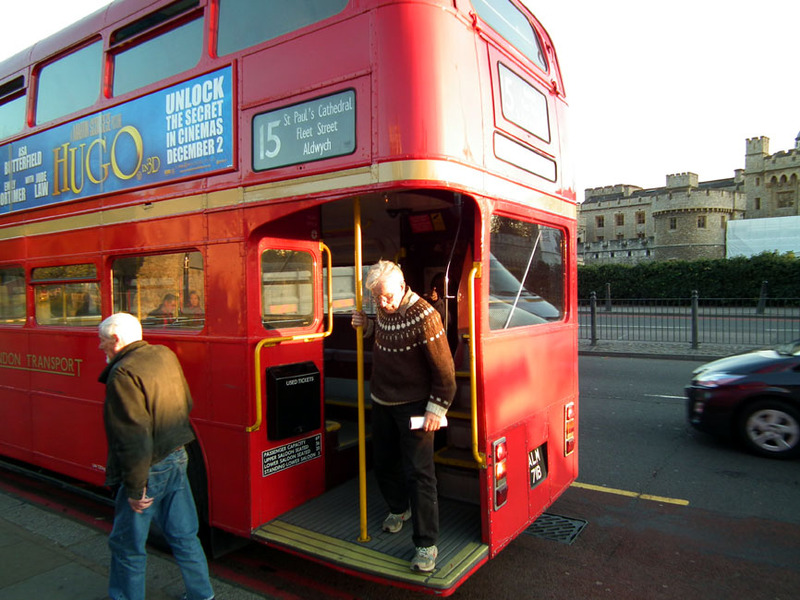 A double decker, 300km/h train? Who wouldn't! As part of my wildlife friendly management of the orchard I have laid down a number of sheets of corrugated iron and big planks of wood in quiet corners of the grass. These provide shelter (underneath) and basking places (on top) for small mammals and reptiles. Every couple of months I lift them to check who is 'at home'. There is a mad scramble for burrows and usually all I get is a glimpse of retreating furry bottoms. A few days ago I had better luck though. 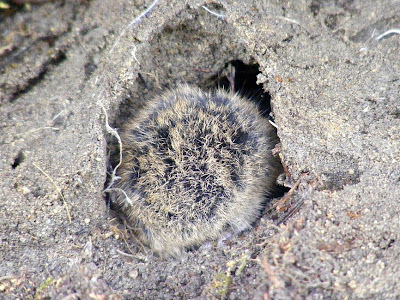 Under one of the sheets of iron was a little family of Short-tailed Voles Microtus agrestis (le campagnol agreste in French). They duly did the mad scramble thing, but within minutes bold little faces were peering out to see if I had gone. I hadn't, so I managed to get one very cute photo. Short-tailed Voles are about 110mm long plus a tail of about 35mm. A fully grown one can weigh 50g, a young one only 20g. 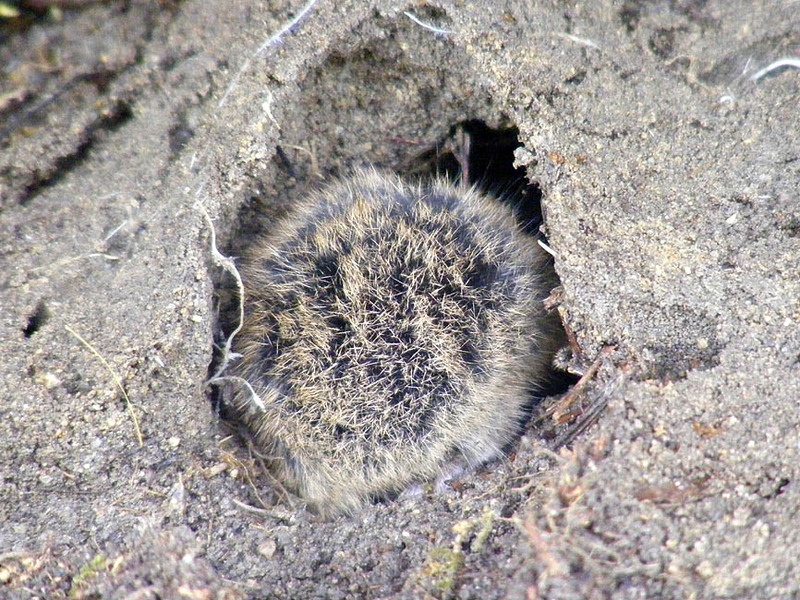 They are quite shaggy for a vole, with hairy ears. 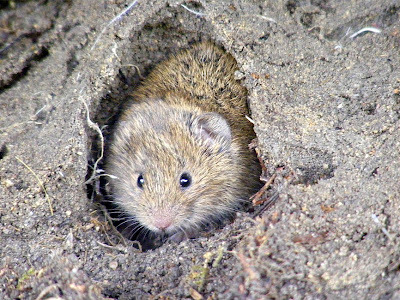 They like to live on the fringes of fields (indeed another English name for them is Field Vole) and can be found throughout France. 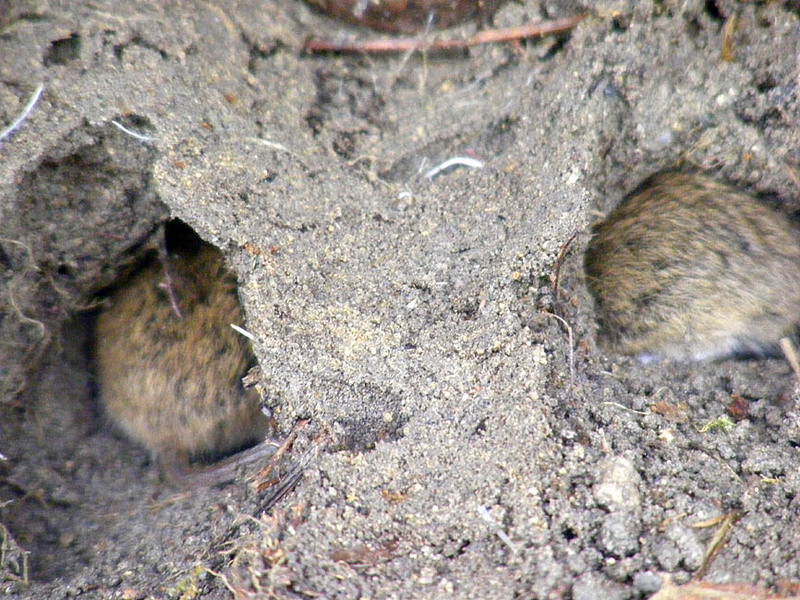 'Our' voles appear to be making a good living from our hazel nuts, but the species also like acorns, bulbs, grasses and roots. Active during the day as well as the night, they can run fast, but rarely climb. They live in social groups in shallow burrows and their numbers can increase dramatically over a 4 year cycle of boom and bust. Occasionally they can cause commercial damage to lucerne pasture or cereal crops, when numbers reach plague proportions. an idea of the burrow network. 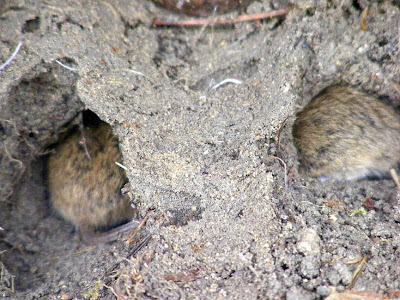 They are the main prey of Barn Owls and the voles' population affects the owls' breeding success. 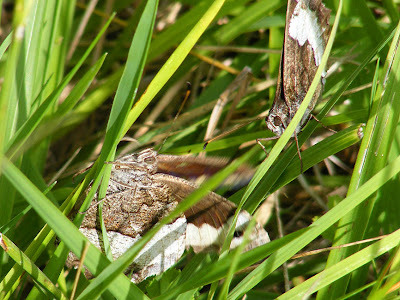 Owls are not their only predators either - weasels and stoats, foxes and cats, buzzards and kestrels, asp vipers and grass snakes are all keen to dine on vole, so it's just as well they breed rapidly.